Enticing fusion dishes that make the most of unusual ingredients from around the globe (including Britain), with professional and utterly charming service. As co-founder of The Providores, chef Anna Hansen has form in creating enticing fusion dishes that make the most of unusual ingredients sourced from around the globe – we guarantee even the most devoted foodie will be bamboozled by a couple of items on the menu. Asian and antipodean flavours (tomatillo, yuzu, tamarind) pop up frequently, alongside plenty of seasonal British fare (wild garlic, purple sprouting broccoli); the combinations can seem bewildering on the page, but rarely falter in execution. Perfectly cooked, flaky, pearlescent cod was offset beautifully by parsnip purée and braised fennel delicately perfumed with camomile. The signature dish of sugar-cured prawn omelette with chilli, coriander and spring onion is still a winner; and blackcurrant and liquorice sorbet was a revelation in intense flavour matching. 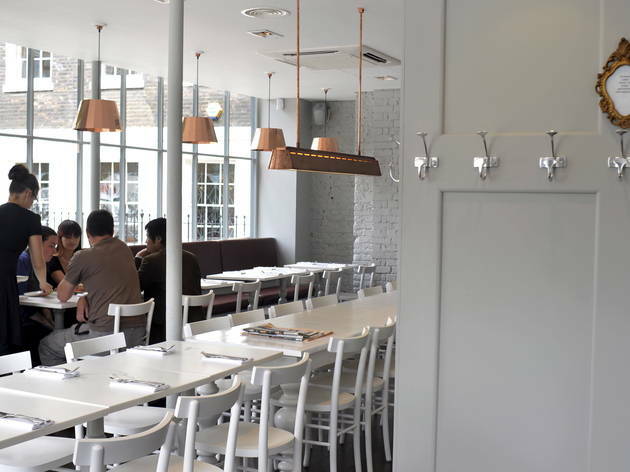 The stylish ground-floor café is quite feminine in feel with its soothing white and grey paintwork, white furniture and burnished copper light fittings – it seems to attract plenty of female diners too. The flexible table layout caters equally well for couples as groups, and intimate conversation is still possible even when the place is bubbling over. White-aproned staff are among the nicest we’ve encountered in London: both deeply professional and utterly charming. There’s a small bar area too and a more formal restaurant upstairs. Only had the brunch here, but it was delicious. Worried the portions were small (for the price) but actually was very satisfying. Loved the cornbread, egg and chorizo. And it was open in the weird period between Christmas and New Year! I met some friends at The Modern Pantry this afternoon and was pleasantly surprised - really unusual and not a plain doughy scone in sight! 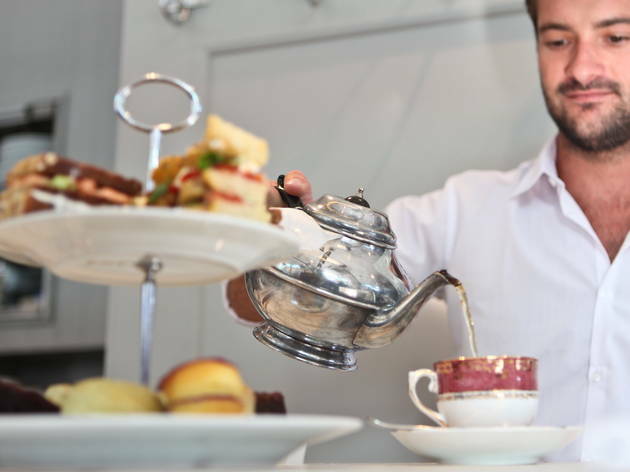 Try green tea scones and little pistachio cakes and sandwiches made with interesting breads - so nice to get something different. I could have done with it being a bit cosier as we sat at a communal table but on the whole a really good experience. Great place for brunch. I had the seafood pancake which was delicious and the coffee is pretty good to. It's a little pricey and the service is not incredible but I definitely go again. Loved The Modern Pantry! Met a friend for brunch, and the food and coffee was delicious. The decor is very homey feeling and really comortable. Staff were friendly and helpful. Will definitely be going back! I organised a Sunday brunch at the restaurant for 11 people. The occasion was my boyfriend's birthday. Everyone thought the place looked lovely, especially when the morning sun was shining onto the large trays of sweet bakeries on the white tables. Most of the food was excellent too! From the sweet pastries and the granola-müsli to the full English breakfast, it was all delicious. However, the pancakes I ordered weren't really pancakes, but more like sponges, very heavy and slightly flavourless. And my friend ordered a passion fruit smoothie that was more like a milkshake! Luckily she was able to exchange it with a black current smoothie (that had no milk in it). We were served by a number of staff, most of which were very friendly, though some must have woken up on the wrong side of their bed! Never mind, we all had a lovely brunch! Went to the upper floor for dinner on last saturday and was overall very satisfied with the food - the pork belly was perfectly cooked and compared favourably well with the ones I had at the OXO tower restaurant, Roast or the the Luxe in Spitafields. In contrast to the comments below, our (American?) waitress was top notch: I found the service approachable, helpful and knowledgeable, which suggests that they've fixed any problems that might have been experienced in the past. I was pleasantly surprised, and will definitely return. What an evening - went based on the Time Out review and had a good read through all the comments below and other online reviews before turning up. We did not have a reservation but the Maitre'd was accommodating and had the four of us seated within 15 minutes - acceptable given no reservation and it was 8pm on a Friday. The service and food was brilliant and I thought the portions were reasonable. I would recommend if fusion is your thing. Cant quite believe what I read. The Modern Pantry has made me brunches (this is their forte) on 4 or 5 occassions and each time it has been brilliant with service to match... I'm inclined to let the knockers knock the place so I can always get a table!!! Wow, what negative reviews! My partner and I had a fantastic lunch there just a few months ago and loved the entire experience. We thought that the food scored very highly both on flavour and appearance. It was reasonably pricey but not outrageously so. In fact, we enjoyed it so much we have booked up to go back there again in December. I shall report back. Having been to the Pantry restaurant on a few occasions, I can understand many of the comments left below. The 'cakeage' charge fiasco described by one visitor is incredible and reviewers are right in suggesting that the portions aren't large enough, particularly where the breakfasts are concerned. But this is a Tale of Two Pantries because round the side of the building is a little room where you can get takeaway lunches and coffee. This is a real gem. The coffee is the best I've had in London - it leaves Monmouth Coffee in the dust - and although the Pantry gets its beans from nearby Caravan, the coffee at the latter is not as good for some reason. Furthermore, the cakes are delicious and always inventive, from beetroot muffins to pastries topped with mojito icing. The staff who man this part of the operation are really lovely too. The negative reviews are a bit surprising. We turned up for a very late lunch this Sunday and had a great meal (around £20 each for 2 dishes including service). My main course of rabbit was excellent, my partner's vegetarian stack was also very good. An inexpensive wheat beer rounded off the experience nicely. Followed up by a great coffee at St Ali around the corner. A great brunch! This has been on my list to try for a while now and finally got the chance last weekend. I liked how the menu had a bit of an Asian twist to it - the blend of flavours were lovely. I had the English Muffins with Mushrooms as my main. This was so great! The English Muffins were SO fluffy on the inside and nicely toasted on the outside. The mushrooms had a little spice kick to it, well seasoned, and had a lovely texture. The poached eggs were cooked well - the yolks were runny and golden! They were sprinkled with crunchy bits, which added a nice layer of texture. For dessert, my friend and I shared two desserts. The first were the trio of Doughnuts - one was Pandan, one was miso caramel, and one was marmalade. The first was definitely my favourite, the pandan was so spot on! The other two were a little too strong - miso caramel was too salty and the marmalade was too tart. The Brownie was definitely the better option. It was a fudgy in the centre and had lovely crisp outer bits. It was served with crème fraîche, which to be honest, didn't add much to the dessert. It could have done without it. Overall, the service was nice. Our waiters and waitresses were friendly. However, our desserts did take a while to get to us. 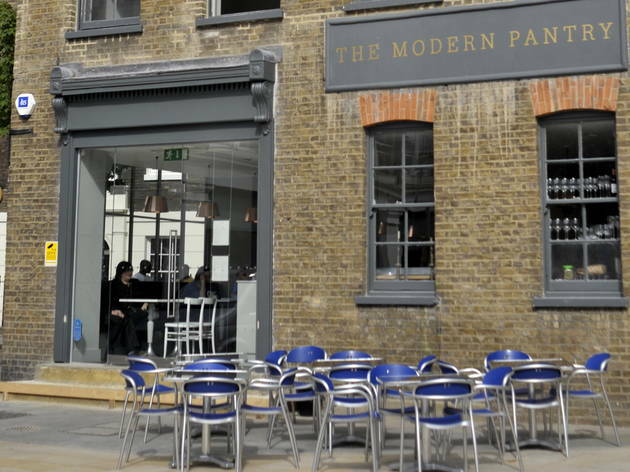 The Modern Pantry has gorgeous interiors, a great outdoor area and friendly staff. I only visited for drinks and they were lovely, but a little pricey. I'd definitely visit again to try brunch. Came here for brunch with a large group. Waitstaff were pleasant and food came fairly quickly. I started with the chia seed and oat muesli and for my main eggs with haloumi, tomatoes and spinach. The haloumi was deep fried which almost made it evaporate-- would have preferred it simply grilled but it still worked. The green smoothie was equally delicious and refreshing. Very bright and airy location, perfect for a sunny day! years ago I used to pass Modern pantry every day on my bus ride to work. Eventually I stopped in for brunch and since then, it's been a great staple! 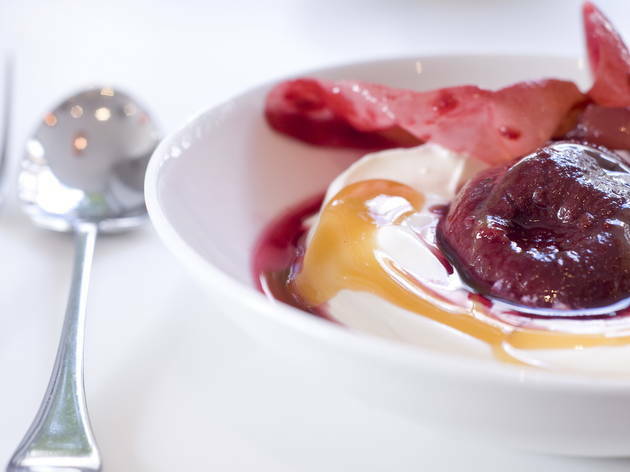 The brunch is exceptional with the different array of pastries (try their daily croissant choice) and their availability of alternatives or dietary requirements are also great! The afternoon tea is also really good- no sandwiches in sight, with the alternatives of vol-au-vents instead made it feel much more modern. Needless to say, I'll be back. I absolutely love the halloumi here, some of the best I've had and I've had a LOT. 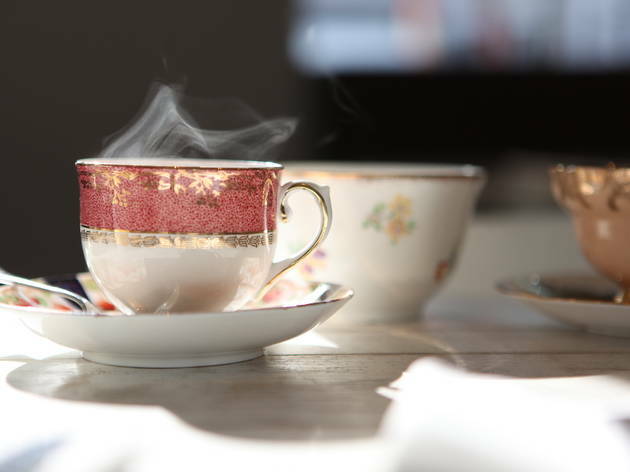 Everything on their brunch menu is delicious, and the decor is clean and classy. Great for a fancy brunch. There are tables outside as well for when it's warm enough. Definitely book, and quite far ahead to avoid disappointment. They do everything well here, even the tomatoes are the best I've had, seasoned beautifully with garlic. Modern Pantry is an absolute beauty of a brunch spot. Me and my friends all snapped up the Eggs Hollandaise and were not disappointed. Lovely clean interior, sumptuous food and a good catering selection for everyone! Taking a close friend for a birthday treat, we weren't disappointed. This has to have the most creative and original menu that I have seen. There were a number of ingredients I hadn't even heard of let alone tasted! The buffalo camembert salad with roasted peach slices, batons of courgettes and various other ingredients, was delicious. My friend opted for the large spring roll filled with asparagus, ricotta and sea beet, fennel, leek and yuzu purée accompanied by wakame and edemame salsa. She couldn't stop raving about it. I had booked. Thank goodness, because at 1:00 it really filled up. We were taken upstairs where there is more space and you can see what the original building must have looked like. Lovely! The food was wonderful. The service was good as it had to be with the automatic twelve and a half percent service charge added. It wasn't cheap, the mains started at £15 and went up to £21 but for an occasion is it certainly worth it. This place supposedly has a good reputation, but I'm not convinced. I always call in advance about wheelchair access. They said it was, with accessible toilet... but to my dismay, there were two large steps at the entrance. Ok, so they did have a side door with a smaller step, then a ledge, and apparently a ramp to get up, but a member of staff managed to help me up so the ramp didn't make an appearance. Once inside, they did have an accessible toilet but the dinning area is quite narrow. Lucky it was a sunny day so I didn't mind having a table outside. I had a look at their menu online and it doesn't seem to have been updated as the one thing I wanted to try (the cornbread) was not on the menu presented to me. How disappointing to have to settle for second choice. Food arrived and was ok. As we were enjoying the sun, we became peckish again and ordered pancakes to share. This was the only item on the menu with a comment to allow 20 minutes to serve. I queried this with the waitress but she didn't know and said that it needed to be cooked... But surely everything else required time to prepare and cook, what was so special about these pancakes? She laughed embarrassingly and walked away, not offering to find out. Sure enough, they took at least 20 minutes to arrive. They didn't look too bad, but they were not like any pancakes I've ever seen before. They were more like squished cakes so I decided to rename them "flatcakes". Definitely not worth the wait. In fact, they were still raw in the middle so perhaps 20 minutes wasn't enough time! I asked the waitress if it's supposed to be like this. She replied she didn't work in the kitchen so didn't know and would ask. I felt staff had poor knowledge and were not helpful. Another waitress came by after a bit of a wait. She said the kitchen was closed so could not redo the dish. I wouldn't have accepted another plate even if it were available and immediately asked for it to be sent back and taken off the bill. Very rare for me to send something back but I would have felt cheated to have to pay for these raw, flatcakes which we didn't even eat. My fave place for brunch after the gym. It's always so good and even better if u get a table outside in the sun. BLISS! I had been to the Modern Pantry before and was impressed. It was my sister's hen do so thought it would be a nice place to start our day. How wrong I was. The waitress was rude - it was like she was doing us a favour. The Modern Pantry seemed grubby, the floor dirty and there is a small bar area where a few rough looking guys were handing out. The tea itself was so disappointing - tasteless, not fresh, un-appetitsing to say the least. 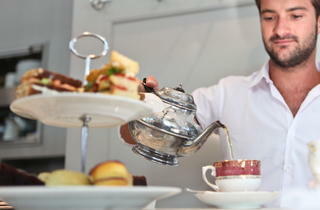 I have been to tea at various other venues and they always top up your tea and often top up sandwiches and cakes. When the bill came we didn't feel the service charge was worthy @ nearly £50 and declined to pay it. Then (for some strange reason) we had the full attention of the waitress! She made a huge full and physically made us go up to the till with her - she was saying we still owed the tip and got quite aggressive. The manager then come over to try and assess the situation. The waitress then stood behind us rolling her eyes and making rude facial expressions - the manager had to ask her to step away from the situation. The manager took the tip off the bill but wasn't very gracious and didn't really apologise. I'm all up for tipping (my husband is a London taxi driver) but surely the service must warrant the tip and it not be expected. I definitely won't be going back. Clerkenwell isn't an area I'd usually go to for a meal out, but Instagram led me here and I'm so glad! 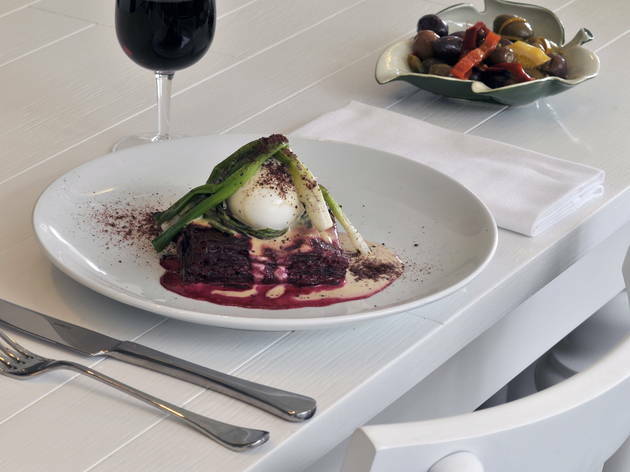 The Modern Pantry is a minimal, bright and airy space serving up fresh, fusion cuisine and eclectic wines & cocktails. My Sunday visit involved their beautifully refined and affordable Weekend Brunch menu - toasted buckwheat muesli, blackberry and ricotta pancakes and rose mojito's are all recommended. I'll be back for Afternoon Tea very soon. 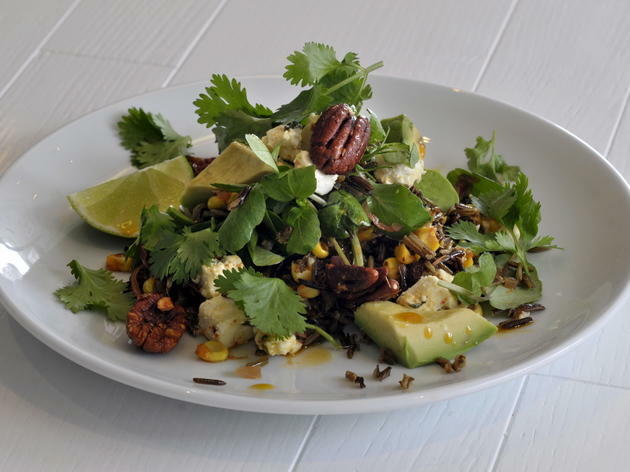 They have really nice and healthy salads, good vegetarian options and are very creative with ingredients, mixing up some vegetables I wouldn't think about. Sometimes the portions are a bit small, especially the meats, but still worth it as they are very well prepared. They also have some good sauces like the green sweet chilli. Yummy. Had a wonderful Summer dinner at The Modern Pantry a couple of months ago. Despite being very busy, my friend and I succeeded to get a table in terrace without reservation. The staff was lovely and very accommodating as we were some of the last customers of the evening. Their menu was fascinating and we were tempted by every dishes. We selected 3 starters and 1 side to share which were delicious and beautifully enhanced with exotic flavours. We couldn't finish without a sweet touch and we had a lemon cheesecake with black sesame paste which was fresh and light - and a chocolate cake with raspberries which was a bit bitter and sickening. Overall we had a great experience, I would definitely go back to try their Autumn and Winter menus...and why not their afternoon tea! Great food with super service. Delicious and healthy! Great ingrédients, well prepared, set in the lovely St John's square - oh and bakery attached ! We got lucky with the nice weather to find a table outside for dinner. The menu is sophisticated but not too much and it is really hard to make a choice as everything sounds pretty good. 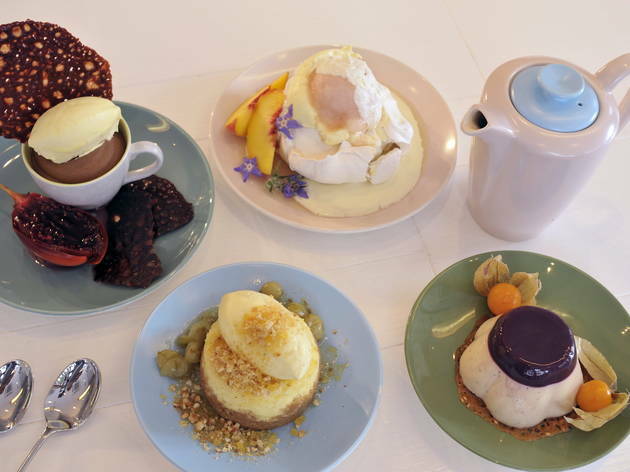 To try most of the menu, we decided with my friend to take 3 starters to share and a side, and each of us took a dessert – we can’t fight against the sweet tooth. Describe what I ate won’t be any help as the menu is changing quite often and just changed, a few days after our visit. The dessert I took was really nice, a sesame and lemon cheesecake with black sesame paste and tile, but the one my friend took was a bit deceiving, especially because it was chocolate and this is a bit of a crime to fail a chocolate dessert! Fortunately, they change the menu, and I hope the new chocolate dessert is much better! This is a really nice place for dinner more than for lunch as the bill is a bit salty for a casual lunch. Salad take out was AMAZING! I had a lovely piece of salmon with all the salads on the day. They are so many variety and favours. 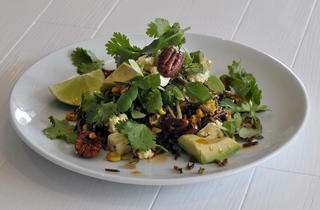 Crunchy, minty, sweet and vinegary all worked so well together. A perfect filling and not boring lunch on a nice summer day! What a beautiful place for a sunny Sunday brunch. The queue for an outdoor table wasn't as long as you might expect, and the staff were very courteous while you were waiting - which often isn't the case elsewhere. The menu was impressive and varied, with some unusual options beyond the traditional eggs on toast. I had a jasmine and mint iced tea which was delicious and refreshing. The main of fried eggs on cornbread, served with chorizo and a sweetcorn and avocado salsa, was beautifully presented and had the taste to match. It was fresh, interesting, and had a wonderful mixture of textures. My one complaint is that is was only lukewarm when it reached me - this is where Modern Pantry loses a star. But overall, a wonderful place to spend a sunny morning in London and I foresee many a happy hour spent here. Great lunch or breakfast venue. 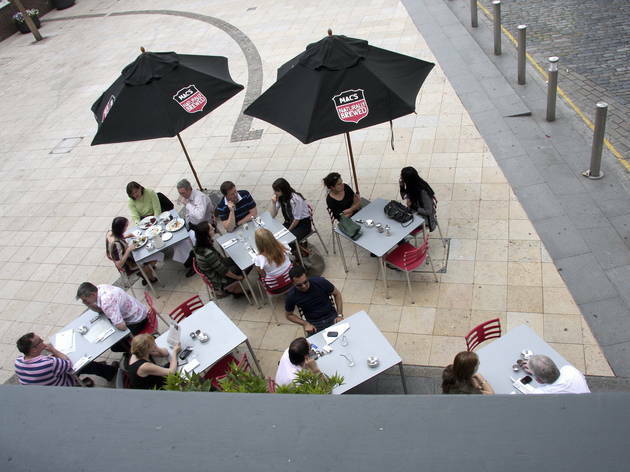 I used to work in the area and would often go for a breakfast or lunch meeting. Beautifully light with a small terrace at the front of the restaurant which is wonderful on a sunny day. Great food with interesting combinations of ingredients and tastes. Absolutely delicious brunch served with one of the best coffees I've had in London. A big table of us was served efficiently by friendly staff. And, although perhaps a minor point, the way that they split the bill for large parties is a brilliant idea! Great for a brunch on a Sunday morning. A little overpriced, but the place has a great atmosphere and really good food, so definitely worth a trip if you're feeling a little hungover at the weekend! Lovely afternoon tea for a friend's birthday. Great surroundings on a old cobbled street, we stuck around of a while after trying out the cocktails. Perfect place for a girly afternoon! A beautiful and bright dining venue with fabulous brunch menu. We've been there twice on each of our last two trips to London from San Francisco. Warmth and cool in equal measure. 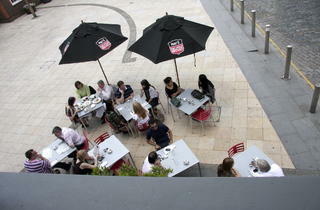 Great outdoor space for summer lunch, genuinely different food and lovely people. I have been eating at The Modern Pantry since 2009 and, having been fortunate enough to have eaten in some of the most amazing restaurants all over the world, this remains my absolute favourite! If you come here for breakfst or brunch, the food is amazing, but it's quite a different place in the evenng to come for dinner. Breakfast is simple but beautifully executed, from the homemade bread to the homemade muesli or boiled eggs and marmite soldiers. The menu at dinner is always incredible with lots of unusual ingredients you may never have even heard of but, whatever you order, every mouth watering bite will be incredible, and Anna Hansen and her team have never failed to impress and delight me in my 6 years or so of dining there as frequently as I can. Had the best afternoon tea here with the girls! Love this place for breakfast. You'll definitely need to book ahead. Great for breakfast. Lovely food for lunch and dinner but very slow service. I found myself here on a lovely and sunny Sunday afternoon, the perfect setting for a casual brunch. I am glad I chose to spend it here. The dishes are inventive and are mainly asian-influenced fusion dishes. Bold flavours are mixed in a way that you would not always imagine, and overall they come off perfectly. The sambal prawn omelette and the sashimi are both excellent. Other tables had the tea set (with three tiers of confectionary and cute little tea pots and cups) which did look good as well. Maybe next time! Afternoon tea here was a total delight - great service and really different take on afternoon tea that focussed on flavours rather than just silly gimmick afternoon teas that seem to be doing the rounds right now. Each item on the menu was full of flavours and little surprises - liqourice jam etc...and savoury scones made a welcome change. I'll be back. Great brunch spot - be sure to get there early and snap up one of the hazelnut or almond croissants! It's a bit busy but worth it. I recently attended a birthday lunch at Modern Pantry on 6th March. We were a party of 15 and booked at extremely short notice. The restaurant was very accommodating and attentive to all the guests including my 17 month son. But sadly, the entire occasion was marred with the addition of a "cakeage" fee. The birthday girl's sister had made two large cakes for the lunch and we asked if we could serve these desserts. We were told that this was no problem for a "cakeage" fee. None of the guests had ever heard of the charge but presumed that it would be akin to a small corkage - so we were happy to pay. It was only when we received the bill that we found out that this amounted to £30 per cake! To say we were astounded is to be polite. When we enquired why this charge was so high we were told that it was on the arrogant assumption that all diners would spend money on dessert. So not satisfied with patrons paying almost £50 per head the establishment felt they had to levy this farcical charge as well. I have never been to a restaurant which applies this fee (and at such a level). Furthermore, not one person at the table had ever experienced the fee either. Nor is there any mention of the charge on the Modern Pantry website Perhaps all 15 guests were unseasoned and raw gastronauts? And this was an usual feature at London venues. But googling the words "cakeage london restaurant" brings scant results - maybe one or two places. It is not often that I find myself angry enough to complain but I decided to make an exception in this case. I would hope that Time Out will publicise this outrageous arrangement. We visited the cafe for a late lunch on a Saturday and left very disappointed about the entire experience. The waiter looked hangover and in bad need to shower her hair; when taking our orders, she forgot the coffee and my husband main course arrived without the meat on the plate! My eggs were seriously over cooked but decided not to say anything as we just wanted to have our lunch and leave. Shame they could not leave up to your review!